As a 100%, service-related disabled Vietnam War vet, Bruce D. Johnson witnessed first-hand the absurdity of war. In addition to being able to park in those convenient handicap parking spaces, this distinction, plus Spell-Check and a good sense of humor, enabled him to write an amusing book. Bruce currently resides with his wife Gail on the north shore of Geneva Lake, in Wisconsin and enjoys entertaining their grandchildren by dragging them around the lake on a tube behind the couple's speedboat. Bruce D Johnson's 10 Cents and a Silver Star is an extraordinary narration of what soldiers encountered during the traumatic war in Vietnam, and after. From the very beginning of this momentous story, perhaps as momentous as Joseph Heller’s Catch 22, tossing convention out of the window, the author lays bare the scars indelibly imprinted on the psyches of soldiers thrown into the quagmire of a war in Vietnam that was not theirs to fight, by a government devoid of emotion and values. The citation for the Silver Star Johnson received reads: “...distinguished himself by extraordinary heroic achievement and conspicuous gallantry in action, beyond the call of duty." Johnson has no idea to which gallantry the citation refers. The trauma continues after he returns home. The entire process of repatriation is superbly described, keeping the reader riveted to the pages, sometimes smiling, sometimes aggravated, and sometimes bewildered as to exactly what the returning soldier thinks when he acts and reacts in incomprehensible ways. Johnson then ‘sardonically’ describes many events, most related in some way to the Silver Star medal he received, much aggravated by the effect of PTSD suffered by him including the freakish way he gets married and makes it big in the business arena, all the while without an inkling of what he is doing. While this book, for obvious reasons, is not recommended for reading by minors, any reader will love reading about all the events. The pace of the book is excellent. The style of narration is original, the plot even more so, developing perfectly as the reader goes along. The cover of the book is simple and indicative of the settings it has been written about, evoking curiosity. Bruce D. Johnson has written a completely original and penetrating perspective of America’s involvement in the war in Vietnam. A good story; I loved reading it. This book deserves a bright 5 stars for being a fine book and an addition to original prose as the mirror of its times in its genre. Bruce D Johnson's 10 Cents and a Silver Star: A Sardonic Saga of PTSD is a unique military narrative that weaves humor into a tale of post traumatic stress following the gruesome experience of war. It's the tale of a young man who gets drafted into the Vietnam war and who isn't so sure of what to expect, but he quickly is awakened to the reality of terror in a brutal way. It's the story of a Silver Star and 10 cents, but it's an adventure that moves the narrative beyond the war experience into a tale of love and life as he goes on to buy houses and country club memberships. What is the secret of his success after the troubling experience of Vietnam? The narrative answers this question in a brilliant manner. Bruce D Johnson's 10 Cents and a Silver Star is a gripping blend of humor and a military story, a narrative with strong emotional and psychological underpinnings, featuring likeable and well developed characters. Johnson has a unique sense of plot structure and develops very interesting relationships between the characters. Character development is impeccable, and it combines with the humor to make for a delightful read. The quirkiness, the focused scenes, and the emotional strength of the narrative are elements I enjoyed the most in this engaging tale. It will get your emotions rattled, have you laughing at unexpected moments in the story, and you will learn to see painful situations differently. I enjoyed every bit of this story. An eye opening read. Bruce D. Johnson had enlisted, although he wished he had listened to the advice given to him by his grandfather who had fought in World War One. College, moving to Canada, even feigning an injury sure would have been better than lying face down in the mud, sniper fire one side, mortars on the other. Well, he didn't listen and now he was in the thick of it with only his sense of humour and a healthy dose of recreational drugs to keep him sane, or as sane as anyone could be given the circumstances. While in the field he was rewarded with a silver star; there was no ceremony, but the words stuck with him, that and ten cents will buy you a cup of coffee. War is boredom mixed with chaos, gore, dangers, and comrades you have to trust with your life. This is his story, a tale of war, woe, and humour in the face of danger. When I was growing up, and still to this day, I loved to watch M*A*S*H and Bruce D. Johnson has captured a similar vibe with a humour similar to the famed TV series. If you were to bring Hawkeye into a more modern context, this would be a very close result. The humour was great and really lightened the horror being experienced by the characters. There are many memorable lines, chuckles, and even darker moments, as you would expect from a work of this style. Bruce D. Johnson's 10 Cents and a Silver Star only briefly touches on the gore side, keeping it manageable and less horrific than actually being there would be. I thought the dialogue was well scripted and enjoyable and the issues were handled in a very sensitive manner. This book gives you a good, but light-hearted perspective on life in war and the camps and the array of characters are diverse and each has their own important role in giving a glimpse into this war-ridden chaos. A Vietnam veteran reconciles his past while managing his post-traumatic stress disorder in the witty memoir, 10 Cents and Silver Star by Bruce D. Johnson. Upon graduating from high school, Bruce Johnson is advised to join the army before he is drafted into the Vietnam war. Grossly misled, Bruce joins, assuming he will be stationed, as the recruiter suggested, in a quaint German town or the likes. Sadly, after training, Bruce is thrown into the jungles of Vietnam and Cambodia with little life experience and even less war experience. Shortly after his best friend dies in his arms, Bruce is awarded a Silver Star for bravery. Only, Bruce can't think of what he has done to deserve such a prestigious award. As he fights to survive in the pointless killing and pillaging of the jungle's people, Bruce wonders why he and his buddies are even in Vietnam. Upon returning home, Bruce struggles to adjust to civilian life in the outskirts of Chicago while trying to reconcile his experiences of war. Will Bruce be able to absolve his past to live his future? Can he live a normal life while suffering the symptoms of PTSD or will he just become another insane Vietnam veteran? Part humor, part snarky sarcasm, 10 Cents and a Silver Star by Bruce D. Johnson is the tragi-comic memoir of a Vietnam veteran. Bruce's maxim is, "It's better to laugh than cry." His book is a testament to his sense of humor as he grows into manhood during one of the world's most confusing and senseless wars and beyond. Spiked with (at times, sardonic) humor, and many heartwarming incidents, this book will take you on a unique journey through the depths of the hazardous Vietcong jungle, to the mad jungle of Chicago as the author learns how to curb his bitterness and heal the scars of the war. What better way to mend than with humor and penning a great novel? Written in a delightfully snarky first-person narrative, this book will have its readers laughing out loud, crying, and smiling warmly as they experience the wonder of unconditional love, understanding, and hilarious moments. I appreciated how the author shakes the perception of the crazed Vietnam veteran while touching on the more painful and sensitive issues such as PTSD and the resulting trauma of war. I recommend this book to readers that have family in the military or would like an inside peek into the life of a soldier at war. 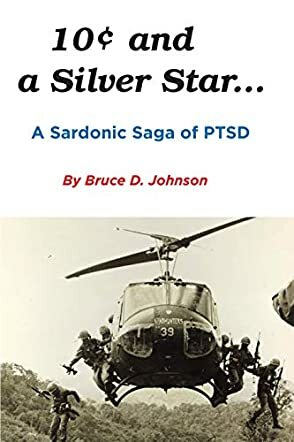 The title 10 Cents and a Silver Star: A Sardonic Saga of PTSD is a work of humorous military fiction penned by author Bruce D Johnson. Set during and after the horrific events of the Vietnam War, Johnson turns the terrors of that time on their head, presenting an unknowing young man who is traumatized by what he’s seen in the field. The real story begins after his thirteen months of hell, when he returns to the real world, which doesn’t feel all that real any more. His new ‘attitude’, the tough cover up for his inner trauma, allows him to play out the dreamlike American dream as a surreal and funny chain of events, looking at the lighter side of coping with PTSD. Considering that over half a million fighters returned from Vietnam with PTSD, this single story says a lot for the ones who kept their heads down and attempted to return to normal life. Author Bruce Johnson plays out the trivialities of normal life really well with his protagonist’s sharp and often wicked sense of humor, turning everything to comedy to spare himself any pain. The narrative is brilliantly done and consistent, never removing us from our privileged position in the narrator’s head, keeping us close to both his horrible flashbacks and his witty observations on civilian life. The jokes are naturally placed and not over-saturated, and I found a true emotional quality beneath the text that really made my heart melt. Overall, 10 Cents and a Silver Star: A Sardonic Saga of PTSD is a must-read for fans of post-war drama.